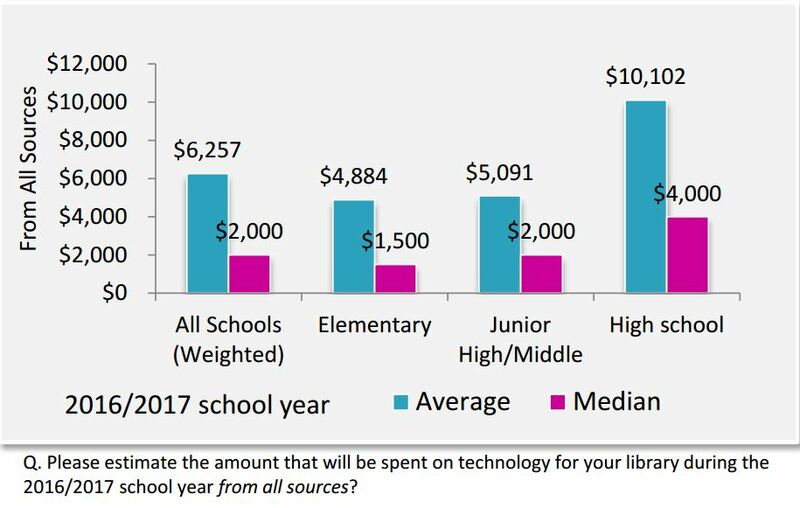 The School Library Journal recently published the results of their 2017 Technology Survey and found that school librarians are experiencing increased spending on digital tools for their libraries, allowing school librarians to become technology leaders within their school districts. The survey found that the average amount spent on technology per school has increased by 75% in the past two years, from an average of $3,633 during the 2014/2015 school year to $6,257 in 2016/2017. School librarians are primarily responsible for tech usage in the library itself, but about half (45%) of the school librarians responding to the survey noted that they also collaborate with teachers to present tech-integrated lessons. More than a quarter (27%) of respondents have created even deeper partnerships with teachers to co-teach technology-rich lessons. Four in ten (41%) school librarians reported leading professional development activities using technologies in the library. Survey respondents felt that their colleagues were supportive of librarians taking a leadership role in purchasing and implementing technology in their school. They reported that the majority of administrators (60%), teachers (68%), and students (70%) view school librarians as technology leaders. More than two-thirds (68%) of respondents noted that they also feel supported by their school or district’s technology coordinator. About a third (32%) of survey respondents said that being knowledgeable about the technology used in their schools provided them with added job security. For more information about how school librarians are incorporating technology into their libraries, you can find the full report here.